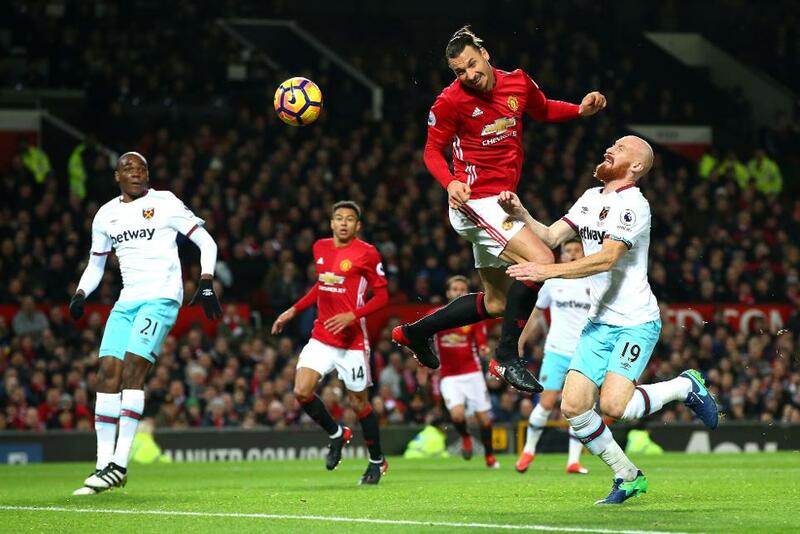 Manchester United were held to their fourth successive home draw for the first time since 1980 as they came from behind to share a point with West Ham United in an enthralling match at Old Trafford. United fell behind to the second earliest goal they have conceded in a Premier League match, when Diafra Sakho headed Dimitri Payet's free-kick past David De Gea with just 90 seconds gone. Jose Mourinho’s side levelled on 21 minutes through Zlatan Ibrahimovic, who rose to head Paul Pogba’s searching pass past Darren Randolph. In an eventful first half, in which Man Utd manager Jose Mourinho was sent to the stands, Randolph’s boot denied Marcus Rashford when he was put clean through on goal and the visiting goalkeeper also turned Jesse Lingard’s header wide of goal. In a breathless second period Randolph saved from both Lingard and Pogba, but the Hammers, who might have scored themselves had De Gea not saved from Ashley Fletcher late on, held out for the point that lifts them to 16th place. United, in sixth, lie 11 points behind leaders Chelsea and eight points behind fourth-placed Arsenal.